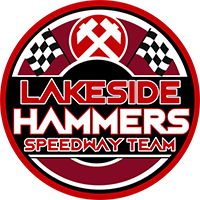 The Lakeside Hammers are through to the Championship Shield Final after an excellent second leg performance at Peterborough on Sunday. 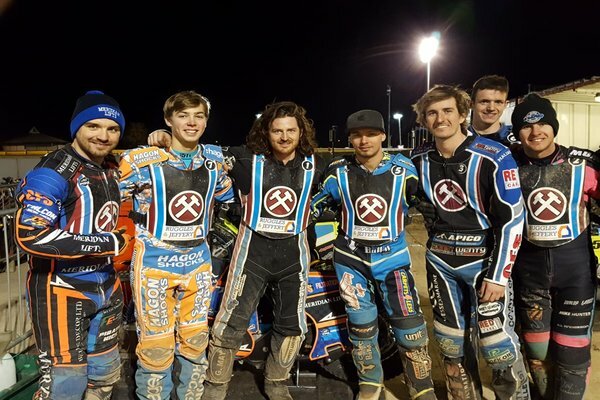 The Hammers led by ten points from Saturday’s first leg, and their defence of that margin was virtually impeccable, with a narrow 46-44 reverse on the night easily enough for them to progress. Heat-leaders Richard Lawson, Nick Morris and Adam Ellis were all multiple race winners as the Panthers were never allowed to build up a head of steam, and guest Josh Pickering also played an important part with paid-10. Hammers suffered an early setback when guest reserve Kasper Andersen crashed heavily when holding a clear lead in Heat 2, and that effectively ended his contribution. But the awarded 5-1 to the Panthers was turned around by Lawson and guest Pickering in Heat 5 to level the scores on the night. A decision went against Kyle Newman in Heat 7 when his last-ditch bid to pass Carl Wilkinson for third place was deemed to have fallen short – but Pickering then pulled off a stunning ride in Heat 8 to go from third to first, getting past Simon Lambert on the inside before reeling in and then rounding Ulrich Ostergaard on the last lap. Youngster Jason Edwards held a key third place in Heat 9 before home man Emil Grondal came to grief when trying to pass, and that helped Hammers to move into a 12-point aggregate lead going into the final third of the meeting. An hour-long delay followed Heat 11 due to the failure of the floodlights on the back straight with temporary lighting brought in to complete the meeting. Peterborough went ahead on the night with a 5-1 in Heat 12 but Lawson then superbly kept Michael Palm Toft at bay to put Lakeside on the brink of progression, and Newman sealed it with a well-deserved race win over Ostergaard in Heat 14. Hammers boss Will Pottinger said: “We put ourselves in a good position on Saturday night by getting a double-figure lead, but we treated the second leg as 0-0 from the start. “I know it’s a cliché, but we wanted to try to win on the night. We fell just short of that in the end, but we got the job done overall so we’re more than happy. “It wasn’t straightforward one way or another, with Kasper getting injured and also the floodlight failure, but we put in a really good performance. “We know we can do well here, so it gives us a good chance of doing well again next week, which is the crucial one in the play-offs – but the Shield is a Final we’re now in, and we’re pleased to be there. Hammers will face Workington in the Championship Shield Final, but before that they have the biggest of aggregate ties with Peterborough next weekend in the play-off semi-final, with the home leg at Hoddesdon on Saturday (7pm). Simon Lambert 13+1, Thomas Jorgensen 10+2, Ulrich Ostergaard 8+1, Michael Palm Toft 7+2, Carl Wilkinson 4+3, Emil Grondal 4+1, Bradley Wilson-Dean r/r. Richard Lawson 12+1, Nick Morris 9, Josh Pickering 8+2, Adam Ellis 8+1, Kyle Newman 5, Jason Edwards 2, Kasper Andersen 0.